When you think of food services, you don’t necessarily think of enterprise printing. But the need for printing—make that highly available, flexible, effortless printing—is ubiquitous, regardless of an organization’s industry sector or its size. And that’s why so many organizations are turning to PrinterLogic. Take one of Canada’s largest food processing companies. The complex global logistics of its ingredient supply, food production and perishable product distribution call for an enterprise print environment capable of meeting those demands. The company’s includes over 500 physical printers located among more than 25 sites. 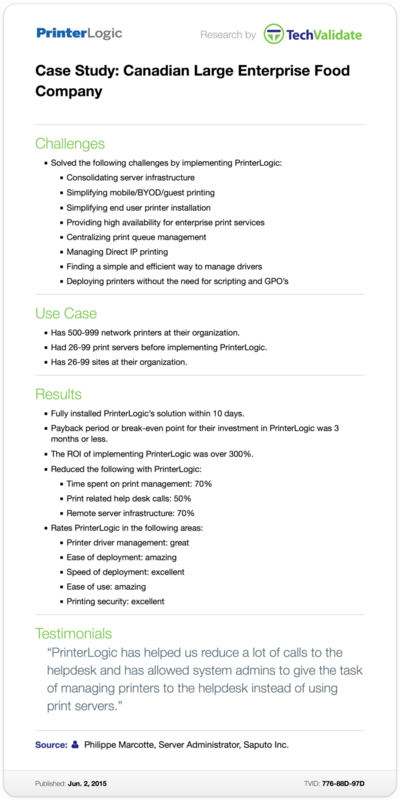 By migrating to PrinterLogic, the company was also able to rid its enterprise print environment of more than 25 costly and troublesome print servers. What’s more, the break-even point for their investment in PrinterLogic was less than three months! No wonder the company was further compelled to rate PrinterLogic’s ease of use and ease of deployment as amazing, and its speed of deployment and security as excellent. “PrinterLogic has helped us reduce a lot of calls to the help desk and has allowed system admins to give the task of managing printers to the help desk instead of using print servers,” said a server administrator at the company.